Hon. Samuel W. Jones married Maria Bowers Duane, daughter of James Chatham Duane and Mary Anne Bowers.1 Hon. Samuel W. Jones died before 1858. Sarah Jones was born on 4 June 1686 in Concord. She was the daughter of John Jones and Sarah Temple. Sarah Jones married Lt. Daniel Hoar, son of Daniel Hoar and Mary Stratton, on 20 December 1705. 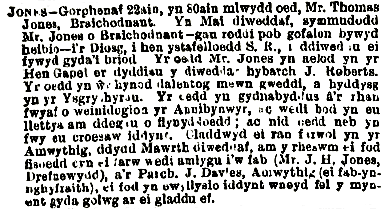 [S205] Newspaper, Y Dydd, 27th August 1869. [S205] Newspaper, Banner ac Amserau Cymru, 4 August 1880. [S480] Emma Ten Broek Runk, The Ten Broeck Genealogy, #225. [S232] Ancestry.com, Texas, Select County Marriage Index, 1837-1977. [S232] Ancestry.com, Texas, Death Index, 1903-2000. William P. Jones married Sarah C. Cowan. [S555] J. Horace Round, Peerage and Family History, p. 129. [S109] 1850 United States Census, Westrook, Cumberland, Maine. [S474] George Thomas Little, Genealogy of Maine, p. 1223. Joan / Jane Jordan was the daughter of Richard Jordan dominus de Flotesbroke and Agnes de Puleston.1 Joan / Jane Jordan married John Barbour, son of Thomas Browne alias Barbour.1 In 1481 Staff. Joan Barbour, widow, sued Robert Taillour, of Warton, co. Stafford, husbondman, for breaking into her close at Weston Harold and cutting down her trees and underwood. Robert did not appear, and the Sheriff was ordered to arrest and produce him on the Octaves of St. John the Baptist. [S144] William Salt Archaeological Society, Staffordshire Historical Collections, 1914. p. 76. Chetwyn's History of Pirehill Hundred. [S144] William Salt Archaeological Society, Staffordshire Historical Collections, Vol. VI. N.S. p. 133. [S144] William Salt Archaeological Society, Staffordshire Historical Collections, Vol. VII. N.S. p. 269. BELIEVED HIS FIRST WIFE DEAD. George H. Joyce Now Desires Divorce From Second Spouse. George H. Joyce married Maud A. Hayworth in 1884. as he believed his former wife was dead. They lived together In Cambridge for some years, and now, on discovering that his former wife is still alive. Mr Joyce has filed a libel for nullification of his second marriage. The libel was filed with the clerk of the superior court at East Cambridge a few days ago. It says that Mr Joyce, the libellant, was married in form of law, but not in legal effect, on Nov 5, 1884. The couple lived together as husband and wife in Cambridge, but no children were born to them. The libellant says he contracted the marriage in good faith, and with the belief that he had a legal right to do so. [S205] Newspaper, Boston Daily Globe, 9 February 1901.